Here is a neat activity to use as a starter or to finish off the lesson. It’s a game to be played in pairs. I am going to laminate it so the ones they have completed can be crosses off using a dry erase board marker and the sheet will still be usable with other classes. I can’t wait for my classes to play this game 🙂 Hope they have fun as much as I have enjoyed making this activity! 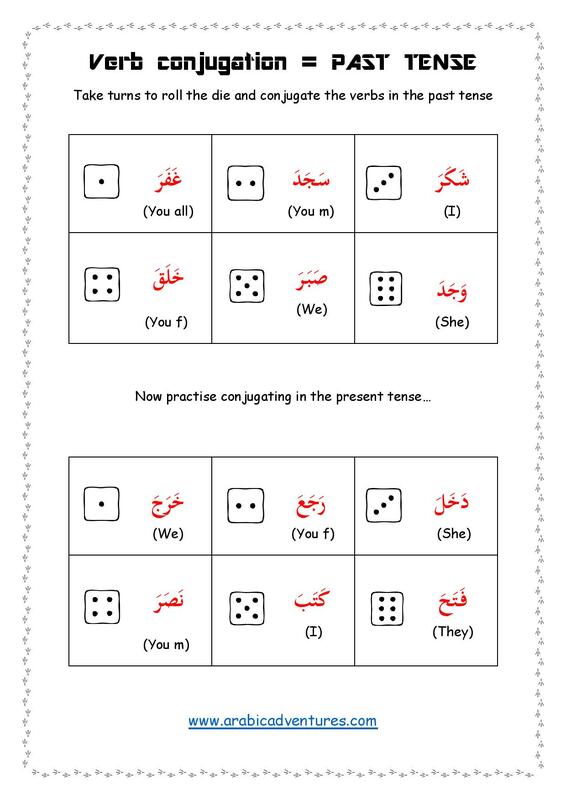 This entry was posted in Games and tagged activity, arabic, arabic conjugation, arabic game, arabic games, arabic grammar, arabic grammar review, Arabic Language, Arabic lessons, arabic past tense, arabic printables, arabic verb game, Arabic verbs, classroom, Fi'il mudari', fil madi, Qur'anic Arabic, Quran curriculum, quran syllabus. Bookmark the permalink.